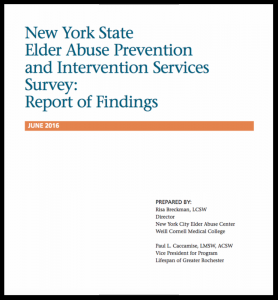 How adequate are New York State’s services for elder abuse victims? This report has the answer. Wouldn’t it be great to have a comprehensive picture of the elder abuse prevention and intervention service gaps and barriers in your state? Wouldn’t this help to get a handle on where things could be improved around your state, so that someday (with sustained advocacy and, yes, adequate funding) the gaps would be filled in and the barriers to obtaining help for victims would be lowered?